A mobile solution from an experienced, full-service payments provider. flexibility to adapt your payment solution as your business grows. VirtualMerchant Mobile is an innovative offering for businesses of any size that want more than just a mobile payment solution from their payment providers. Security – In addition to encrypting card data at the time of swipe through Magtek iDynamo and BulleT card readers, all payment information is immediately sent to and stored in Elavon’s secure, hosted environment to ensure security of cardholder data and to provide added protection for you and your customers. Connectivity – Works with an array of mobile device types, regardless of carrier, to ensure freedom of choice. 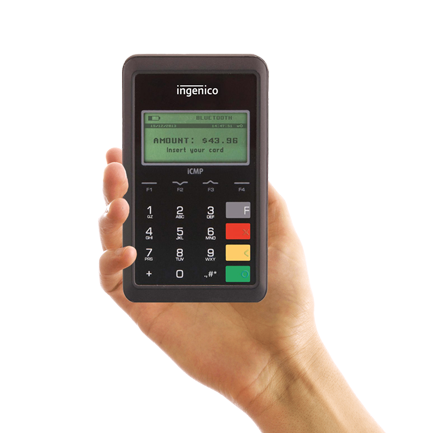 A selection of flexible card readers support card-swiped transactions through all supported mobile products. Flexibility – Supports anytime-anywhere processing for mobile environments including card-swiped or key-entered transactions and is scalable to support an unlimited number of mobile devices for businesses of all sizes. Visibility – Delivers more than just a mobile solution, but also provides the full service, trusted reporting and apabilities of our secure hosted payment gateway, which includes detailed records of reporting for up to 12 months of transaction activity. Simplicity – It’s efficient and cost effective, allowing you to utilize existing hardware, technical infrastructures and communications providers to enable mobile commerce and accept most card payments. With VirtualMerchant Mobile you can utilize existing hardware, technical infrastructures and communications providers to enable mobile commerce and accept most card payments. It supports Sale and Authorization Only transactions and works with Smartphone devices including most Apple® and Google® Android mobile devices. Quick and easy set up and configuration process includes downloading the VirtualMerchant Mobile App from the relevant App Store and entering account configuration credentials which are provided by Elavon. Once your Smartphone is configured, you can accept key-entered transactions. Swiped transactions can be accepted with the addition of a card reader. Elavon supports multiple readers for multiple form factors. Cardholder Information Management and Billing (CIMB) feature allows you to securely build and maintain a “card on file” database of returning or frequent customers card information. CIMB provides “tokens” representing card information that can subsequently be used to initiate transactions and maintain your customers payment details, all without having to store sensitive cardholder information in your systems or on your premises.